iC-WKN is a driver for laser diodes in continuous wave operation with laser currents of up to 300 mA, which requires only four external components. The wide power supply range of up to 15V allows for operation of blue laser diodes. The iC includes integrated circuitry protecting against destruction by ESD, excessive temperature and over current plus a soft start of the regulator to protect the laser diode when the power supply is switched on. 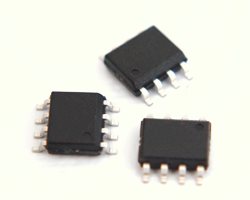 The iC also filters the laser diode power supply for transients. The regulator is adapted to the laser diode by an external resistor at MDA. The monitor current acts as a reference and is regulated independent of the influence of temperature and supply voltage (range: 2.5 μA to 6.25mA). The capacitor at CI determines the control time constants and start-up time. A second monitor input, pin MDK, allows the driver to be used for other types of laser diode configuration; alternatively, it can be used as an analogue modulation input (DC to a few kHz). In the event of failure, such as over current in the laser path due to a lack of feedback, for example, a quick power lockout is activated. The shut down persists until power is reapplied, permitting a restart. The strain on power packs and batteries is relieved and the laser class is retained even in the event of a disturbance. iC-WKN offers additional protection by means of spike detection at pin MDA. Should spikes or oscillation occur at pin MDA the power lockout is activated after a certain time-out.